The dual-double-balanced configuration of these FET mixers helps to improve dynamic range with reduced conversion loss and noise figure without expending DC bias. RECEIVERS (Rxs) in support of the continually expanding wireless marketplace rely heavily on improved performance from mixer components. What was once considered adequate performance in terms of dynamic range— mixer noise figure at the low-level end of the dynamic range and third-order intercept point (IP3) at the high-level end—is no longer good enough. Since modern mixers must provide third-order intercept performance in excess of +35 dBm, the engineers at Mini-Circuits (Brooklyn, NY) set out to beat that number by at least 3 dB, with a new line of field-effect-transistor (FET) mixers designed for third-order intercept performance to +38 dBm. Due to the crowding of licensed and unlicensed bandwidths by an increasing number of wireless applications, including cellular telephones, wireless local-area networks (WLANs), and the coming of Bluetooth devices (see the supplement on Bluetooth packaged with this issue), Rxs are faced with a growing number of undesired carriers along with the wanted signal carriers. When the unwanted carriers are close in frequency to the desired carrier, front-end Rx filters cannot remove the interference signals. The unwanted carriers then mix with each other and with the desired signals and generate intermodulation distortion (IMD). Every system designer wants to minimize IM products. In narrowband Rxs, one of the most troublesome IM products is the third-order product, which is measured in relation to the IP3 of the Rx. The higher the Rx’s IP3, the better suited it is to capture the desired signal in the presence of unwanted IMD. Figure 1: This schematic diagram shows the basic configuration for a double-balanced FET mixer. Conventional double-balanced and triple-balanced mixers are produced using Schottky barrier-diode quads. An IP3 of +25 to +31 dBm can be achieved by using this technique. However, to achieve such high IP3 performance in a diode-based mixer requires a great deal of tuning, which then increases the manufacturing complexity and cost. Well-designed FET mixers, on the other hand, can provide extremely linear performance, and can be used as mixing elements, with high IP3 performance readily possible. This article highlights a series of double-balanced and dual-double-balanced (patent-pending) FET mixers designed for IP3 performance to +38 dBm. Modern mixers with IP3 on the order of +30 dBm and higher typically use FETs as mixing elements. Some of the disadvantages of commercially available FET mixers are a higher conversion loss/noise figure of approximately 9 dB, and the need for DC bias current. Mixers are usually specified for their input IP3 performance. The corresponding output IP3 performance is the difference between the input IP3 and the conversion loss. Thus, higher conversion loss results in lower output IP3. Higher mixer noise figure results in higher Rx noise figure. To reduce the Rx noise figure, high-gain low-noise amplifiers (LNAs) must be used in the front end. However, this increases the signal level (wanted and unwanted) reaching the mixer, and limits system performance due to the IP3 limitation of the amplifier. The need for DC current increases the complexity of a circuit design. The current supply should have low noise, or it may introduce spurious signals at the output. It requires additional real estate on a printed-circuit board (PCB) to transfer the current from its source to the mixer. The need for mixer current increases the DC power budget for an Rx design. Fortunately, the traditional shortcomings of FET-based mixers have been addressed by a line of dual-double-balanced FET mixers and double-balanced FET mixers from Mini-Circuits. The patent-pending dual-double-balanced and double-balanced FET mixers feature low conversion loss, low noise figure, and high IP3 performance, even though they do not require DC bias current and use patented FET quads. Figure 2: The model HJK-21H is a double-balanced FET-based mixer designed for use with RF signals from 1850 to 1910 MHz and LO signals from 2090 to 2150 MHz. Figure 1 shows a schematic diagram of a double-balanced mixer based on FET devices. It consists of four FETs in a quad configuration, along with RF, local-oscillator (LO), and intermediate-frequency (IF) balanced-unbalanced (balun) transformers. The operation of this type of mixer is similar to that of a conventional diode-based double-balanced mixer. The main difference is that the FET mixer has six terminals, compared to the four terminals of the double-balanced diode mixer. During the positive half-cycle of the LO signal to the FET mixer, two of the FETs are in conduction while the other two are turned off. As a result, the secondary winding of the RF balun is connected to the secondary winding of the IF balun through the FETs that are switched on. During the LO signal’s negative half-cycle, the FETs which were on during the positive half-cycle are turned off and vice versa. This results in a reversal of the polarity of the RF signal reaching the IF balun. The frequency at which the FETs are turned on and off is determined by the frequency of the LO signal. This is mathematically equivalent to a multiplication of the RF and LO signals, resulting in the generation of sum and difference frequencies at the IF port. To obtain high IP3, all the switching elements in the mixer circuit should be linear and well balanced. To achieve even higher IP3 and isolation compared to a standard double-balanced FET mixer, a dual double-balanced mixer configuration (patent pending) is used in the new series of FET mixers from Mini-Circuits. These high-IP3 mixers are available in numerous cellular and personal-communications-services (PCS) RF ranges through 2 GHz (see table). An example of the new FET mixer line is the model HJK-21H (Fig. 2), which operates with RF signals from 1850 to 1910 MHz and LO signals from 2090 to 2150 MHz. It yields IF signals from 180 to 300 MHz and is designed for LO power levels of +17 dBm. The mixer exhibits maximum conversion loss of 8.9 dB, with typical performance of 7.6 dB. The HJK-21H achieves typical input IP3 performance of +36 dBm (Fig. 3). The LO-to-RF isolation is typically 28 dB, while the LO-to-IF isolation is typically 25 dB. The mixer, with return loss of typically better than 9 dB, exhibits minimal change in return-loss and isolation-performance levels as a function of LO power. The effect of LO power on RF and LO return loss is minimal for the FET-based mixer, although the effect of varying the LO power on IF return loss is comparable to the effects seen with diode-based mixers. A significant advantage of a FET mixer over diode is in its compression characteristics. The RF power level at which the conversion loss of the mixer increases by 1 dB, when compared to the conversion loss at low RF power, is known as the 1-dB compression point. The 1-dB compression point of a diode mixer is generally 4 to 6 dB lower than the power level of the LO signal, whereas the 1- dB compression point of a FET mixer such as the HJK-21H is typically +20 dBm, or 3 dB higher than the power level of the LO signal. Dual double-balanced mixers employ two FET quads and a novel balun arrangement (patent pending) to achieve high IP3 and high isolation. An example of such a mixer is the model HUD-19SH, which has a typical IP3 of +38 dBm (Fig. 4). This IP3 performance is high enough to meet the most demanding requirements of today’s communication equipment. 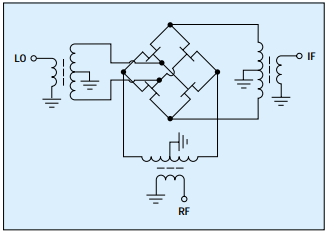 The FET-based mixer is designed for RF signals from 1819 to 1910 MHz and LO signals from 1710 to 1769 MHz. It yields IF signals from 50 to 200 MHz. Its conversion loss, which is typically 7.5 dB for an LO power level of +19 dBm, suffers variations within 0.2 dB for changes in LO power level. The LO-to-RF isolation is also tightly controlled. The isolation performance of this mixer is approximately 8 to 10 dB better than that of a double-balanced mixer, with return loss that is comparable to the performance of a diode-based mixer. Two other mixers are listed in the table, models HJK-19H and HJK-9H. The former is designed for RF signals from 1850 to 1910 and LO signals from 1780 to 1840, and yields IF signals from 70 to 130 MHz. The latter is designed for RF signals from 818 to 853 MHz and LO signals from 753 to 778 MHz and yields IF signals from 40 to 100 MHz. Both mixers are suitable for use with an LO power level of +17 dBm. The HJK-19H achieves IP3 performance of typically +36 dBm with typical conversion loss of 7.5 dB, LOto-RF isolation of typically 28 dB, and LO-to-IF isolation of typically 22 dB. The HJK-9H achieves IP3 performance of +33 dBm with typical conversion loss of 6.7 dB, typical LO-toRF isolation of 35 dB, and typical LO-to-IF isolation of 31 dB. 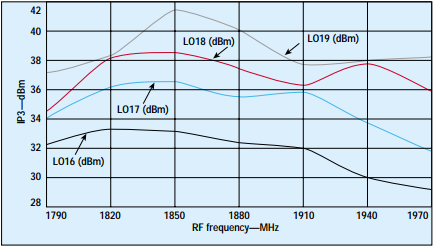 Figure 3: The IP3 of the HJK-21H FET mixer was measured from 1790 to 1970 MHz for LO power levels of +16, +17, and +18 dBm. Future designs will address applications beyond 2 GHz. These FET-based mixers have been developed to satisfy the demanding requirements of modern communications applications. In these mixers, the IP3 performance is predictably sensitivity (with a shift of approximately 2 dB in IP3 performance for every 1-dB shift in LO power) over a 2-dB level of nominal LO power requirements. This is useful for system designers when budgeting for power consumption. In addition to superior IP3 performance, these mixers provide conversion loss and isolation performance that is comparable with the state of the art of present day mixers. A series of FET mixers, which offer an IP3 of +15 dBm in excess of LO power (i.e., +7-dBm LO power mixer offering +22-dBm IP3), is also being offered to complement this series of mixers. The HJK and HUD series of FET mixers have been designed by using standardized fixtures and internal design layouts, enabling automated manufacturing in Mini-Circuits manufacturing plants. Consequently, these mixers are offered at a lower cost compared to market offerings. 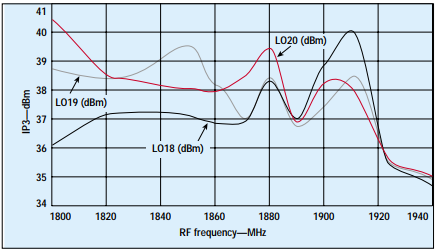 Figure 4: The IP3 of the HUD-19SH FET mixer was measured from 1800 to 1940 MHz for LO power levels of +18, +19, and +20 dBm.